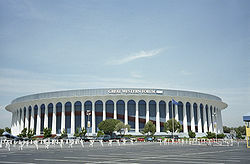 The Forum was also the venue of the 2015, 2016 and 2018 Nickelodeon Kids' Choice Awards. In addition, the Forum has also hosted the 2016 iHeartRadio Music Awards, 2016 American Country Countdown Awards and the 2016 Teen Choice Awards Juan Gabriel performed his final concert of his career on August 26, 2016. Gabriel died two days later. This page was last edited on 15 April 2019, at 02:44 (UTC).